Posted by Abrams • Published 21st February 2013 • See Abrams's 41 projects » © 2019 Yvette van Boven / Abrams · Reproduced with permission. · © 2012 Oof Verschuren and also the book: Home Made Winter by Yvette van Boven is published by Abrams Books. Make the scones: Sift the flour, sugar, and salt into a bowl. Cut the butter into small chunks and add it to the flour mixture; use a fork to work the mixture into a crumbly dough. Add the milk, marmalade, and cardamom. Work the mixture quickly and lightly into a smooth dough. Don’t knead too long or the scones will be tough. On a lightly floured surface, roll out the dough to ¾-inch (2- cm) thick. With a cutter or drinking glass, cut 1½-inch (6-cm) rounds. Place them on a baking sheet lined with parchment paper. Reroll the scraps and cut more rounds. Let the scones stand for 15 minutes before baking, or make them the night before and let them rest in a cool spot. Preheat the oven to 450°F (240°C). That’s hot! Bake the scones for 12 to 15 minutes, until golden brown. Make the glaze: In a saucepan, heat the marmalade with 2 tbsp water, stir in the cardamom, then press the mixture through a sieve into a bowl. 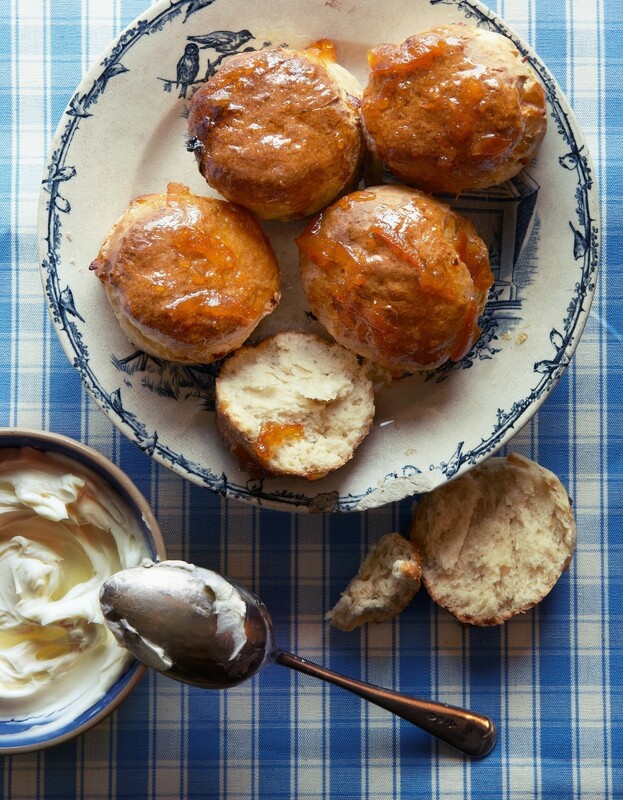 Brush the scones with the syrup and sprinkle them with the orange zest. Make the cream: Fold the orange blossom water and honey into the mascarpone and whip until airy. Serve the scones with the mascarpone cream.